Delivering flexibility, agility and enhancing the entire policy management infrastructure of an enterprise. Business Rule Management Systems (BRMSs) enable a giant leap forward in bridging the gap between business team and IT. Using BRMSs, the business team define their business policies and business rules and provide the clear communication between the policy managers defining the requirements and the developers implementing the application system solution. Business teams have control on exactly how their business rules are being executed, and, perhaps more importantly, the system is designed to facilitate change when business rules change. In traditional information systems, the business policies get hard-coded into the application. When changes need to be made, the entire software development life cycle must restart - understand the requirement, design it into the system, make sure it doesn’t adversely impact anything else, implement the change, test it and deploy it. IT rarely wants to go through this process for a single change, so requirements must be bundled into reasonable work efforts, further slowing down the process. Technology experts to manage and evolve technology using the methods and vocabulary most suitable to their tasks. This separation of concerns is what BRMSs do. A BRMS is a suite of tools that policy managers and software engineers use to build systems in which business policies are abstracted out of software code, where they can be directly authored, modified and managed independently of the underlying software system. 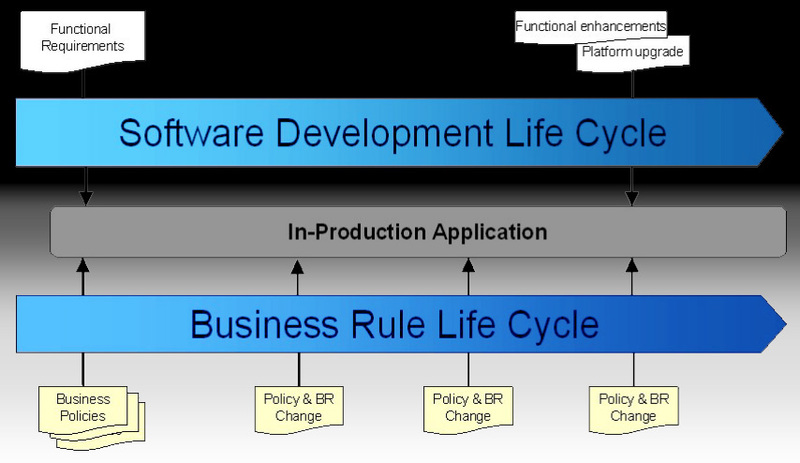 Implement rule changes according to the business rule life cycle. Author rules in business language. Manage rules throughout their life cycle, from creation through testing, deployment and retirement each of these is explained in detail in the following sections. Managers responsible for policy in decision-rich enterprises have benefited enormously from information technology. But as the pace of change has increased, and the reach of automation has been extended, traditional software applications have proven unable to deliver the flexibility and agility these managers require. Applications constructed with BRMSs, on the other hand, can deliver that flexibility and agility, and enhance the entire policy management infrastructure of the enterprise at the same time.